The author of this blog is Jean L. Cooper, Genealogical Resources Specialist at the University of Virginia Library. 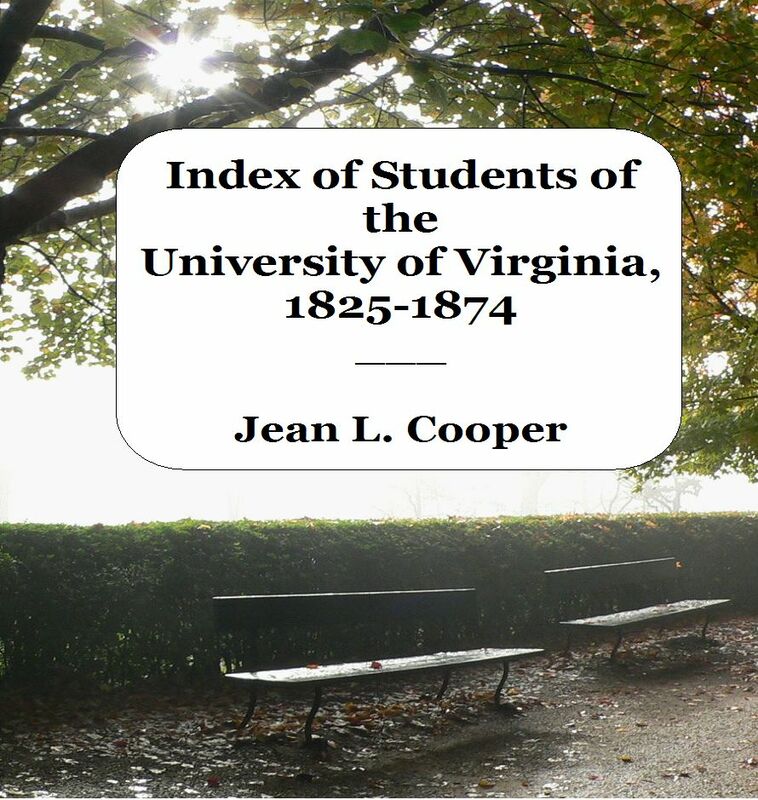 This blog is based on the Index of Students of the University of Virginia, 1825-1874 (Shortwood Press, 2011), which listed the names of over 9,000 men who attended the University of Virginia between the years of 1825 and 1874. After working on the Index, it seemed logical to follow up by delving deeper into the biographies of the early students of the University. Rather than wait until all of the biographies are completed, we’d like to share some of the very interesting people we’re discovering as we find them. The individuals who were the first students of the University of Virginia were primarily from well-to-do families. After leaving the University, many of these young men — U.Va. was a men’s school until 1970 — went on to become leaders in Virginia and the United States, in society, in politics, and in the professions. There are many success stories — and there are tragedies. Please join me as we rediscover their history. I am seeking your approval to reproduce the info you have on Rev Adam Empie and family. This would appear in my Empie/Empey database and possibly on my website which is not on the net yet. Hi — You’re welcome to use this information, just be sure to cite this website. Cooper, Jean L. “Adam Empie (1 Jul. 1821-10 Jul. 1877)” in Students of the University of Virginia, 1825-1874. https://uvastudents.wordpress.com (Posted on Nov. 11, 2011). I’d also suggest you access the resources I used for this article, because there are details that I didn’t include. Some of the sources are also incorrect; for example, a couple of sources mention that Adam and Virginia Empie had 12 children, but there’s no evidence of that in the 1860-1880 censuses. Let me know if you’d like to discuss this. Please send me information on Lewis Malone Ayer,Jr. Charles Augustus Jenkins, one of my great grandfathers, was born on January 20, 1850, in Yazoo County (possibly Yazoo City, or Benton, nearby), Mississippi, where he grew up. Charles A. is neither in the Mississippi or Virginia censuses in 1870. He is 20 or 21 in 1870. In 1870 Charles is in school at the University of Virginia, from which he graduated in 1872. Charles married Lillie S. Cocke, from Albemarle County, on June 30, 1873 in Albemarle County. Charles was 24 and Lillie was 18. Charles’s occupation was listed as teacher on his marriage certificate. According to a biographical sketch that Charles provided the Baptist Ministerial Directory in 1899, Charles graduated from the University of Virginia in the early 1870s. According to University of Virginia records, Charles first enrolled at the University of Virginia in the fall of 1869. He enrolled for the 1969-1870, 1870-1871, and 1871-1872 years, graduating in June 1872 with a degree concentrating in classical studies. In the 1860s and 1870s, and perhaps later, college graduation required three years, not four. Matriculation records at the University of Virginia indicate that Charles took Greek, Latin, and modern languages in his first year and lived at Miss Ross’s Boarding House; took Greek, Latin, and modern philosophy his second year and lived at Mrs. Smith’s Boarding House; and took natural philosophy, history and literature, and modern languages his final year and lived at Miss Massie’s. Tuition then was about $350 and room and board about $275. While at the University the Virginia, or shortly thereafter, Charles becomes a Baptist. While growing up, prior to attending the University of Virginia, and perhaps, during some, or all, of the time at the University of Virginia, Charles was a Presbyterian. His mother helps to start a Presbyterian Church in Yazoo City, Mississippi. (More about this later in this section.). Following his graduation from the University of Virginia in 1872 and his marriage to Lillie in 1873, he attended Roanoke College in Salem, Virginia, where he received an MA degree in 1875 and was ordained in 1875. Presumably, his MA degree was in theology. No further information could be obtained from Roanoke College, other than he did graduate there in 1875. Love this site and the work you’re doing here. I’m going through a similar exercise with alumni of the Virginia Glee Club on my site–there is a very small amount of overlap with your focus (the earliest date we have for the Glee Club is 1871, while the earliest student we have a name for is in the 1880s). Look forward to each of your posts! Thanks for the compliment! It’s a labor of love. Let me know if I can help you in your research. Hi I wonder if you could include our GGG Grandfather Walter Ruding Deverell. He and his wife Dorothy Margaretta sailed with Dr George Blaetterman arriving Dec 1824. He was a student of Dr Blaetterman’s in 1825 and was part of the invitation to dinner with Thomas Jefferson when they arrived. Also his wife get’s a mention in “Thomas Jefferson: Musician & Violinist” – Der Freischutz (opera) by Carl Maria Von Weber. Complete score, inscribed on title page, “Margaretta Deverell”. The only other information we can find about his time there is that he wrote a Plan of Instruction to Cocke “Deverell’s Scheme for his school near Charlottesville” 10 Jun 1827 which I have a copy of. There is also a reference in the Cocke Papers “1827 June 10 Box 51 Plan of Instruction Adopted by Mr. Deverell. …… of a boys school in Albemarle County on the model of the German gymnasia” I assume this would have been for the project planned near Charlottesville for a large academy based on the plan of the German Gymnasium and the plan to rent or purchase Monticello in Nov 1828 after Thomas Jefferson’s death in 1826. This plan did not go ahead which may have been why our GGG Grandfather sailed back to England in 1830. Their son Walter Howell Deverell born in Virginia Oct 1827 was part of the Pre-Raphaelite Painters in London 1840-50’s.